Customer experience consists of countless details, but at the end, it all comes to what a customer thinks of your brand. Sometimes, you think your brand and customer experience are the same thing. In reality, if a customer perceives your brand in a different manner compared to you, that would be your true customer experience. You could use millions of different methods to improve customer experience - from service design to detailed research and questionnaires. One way is right in front of you. Brands are often missing that “social media” is a social platform. Although social media is often used for advertising and brand awareness, do you remember that the best advertisement is a happy customer? Social interaction and engagement is what makes your brand personal and builds a connection to the audience. Very often, your customers are already using social media to discuss your brand. To be precise, in the US alone 67% of consumers have used social media for customer service. Your task is to be available for your customers and (remember, the golden rule!) follow up. Did they ask you a question? Answer. Did they leave a positive note? Thank. Was it a negative comment? Solve it! If your customers like to share about your products/services, then that’s a place for you to be! Engage with the customer feedback, both negative and positive. Follow up positive comments of your customers with a thank-you-note, show that you are close to them and care about them. To provide an example, Kathryn Rannikko found a new product of Jaffa and Fazer and tweeted about it. Fazer did right what it had to do - the company thanked Kathryn for the feedback. Lesson learned: always acknowledge or respond to the positive feedback. That is how you build trust and relationships with your customers. Be available to your customers on social media and answer their requests. Let your social media function as a customer support channel. Find all the channels your customers are using for servicing and be there. A key to success is persistence. Show your customers that every single comment matters and they will boost your engagement rates, asking for help, expressing their opinion and participating in the discussions. Isn’t it how the loyal brand communities are born? Canva shows a great example of how to improve customer experience through social media. Natalia O’Neill had issues when working with the software and reached Canva on twitter. Canva replied on time and connected Natalia to the support team right away, resolving an issue in less than 30 minutes. Lesson learned: customers might use different channels to contact you, your job is to be there when it happens and follow up. It might be, that once you receive negative comments, your immediate reaction would be to delete them. Don’t! Unless the comment is offensive or out-of-all-possible-rules, keep it. If you delete the complaints, customers might think you are hiding something and stop trusting you. Instead, contact the customer, ask what is the matter and do your best to solve the problem. When the issue is resolved, you might contact the customer and kindly ask to remove the comment by themselves. If it is not possible, leave a comment below the complaint that the issue is solved. During a four-hour flight, TV connected to Esaí Vélez’s seat was showing nothing but a grey screen. He tweeted about it shortly after the flight. JetBlue was fast to respond, clarifying the matter with the disappointed customer. Shortly after the company suggested a refund. @EvpLares14 We always hate it when that happens. Send us a DM with your confirmation code to get you a credit for the non-working TV. Results? Esaí Vélez is still a loyal customer of JetBlue Airways. Lesson learned: a customer, who complains is often open for dialogue. Use your chance wisely to convert the unsatisfied customer to the happiest one. Chose a tone of your social media language, that reflects your target audience, and keep to it. A lot of brands use informal language and friendly style when it comes to social media. Let your customer service team have fun, think outside-of-the-box and enjoy interacting with your customers. 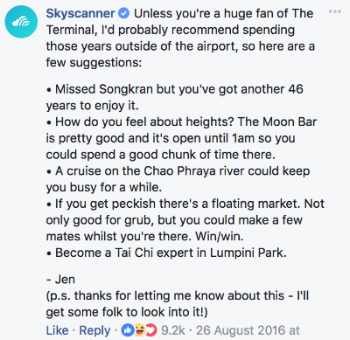 Skyscanner has performed a fantastic example of great customer support on social media. James Lloyd used Skyscanner to find a flight from New Zealand to the UK. The service suggested a route with … a 47-year layover. So, James contacted Skyscanner on Facebook. Skyscanner found a personal approach to the customer and in a humorous way answered the question. The answer went viral and soon after was picked up by the global media and worked as an excellent (yet unexpected) PR campaign for the brand. Lesson learned: social media is the voice of your brand. Always use a personal approach and don’t be afraid to experiment. In the end, it might go viral! Want to know more about Customer Experience? Get our special guide. Newer PostWhat is Role of AI in Customer Feedback Analysis?